Great animated trilogies that have remained consistently great throughout all three films are surprisingly hard to come by, and I’m actually not including the Toy Story series in this argument because it will no longer be a trilogy when Toy Story 4 debuts this summer; in fact, the only ones you can really name that fit the bill come, ironically, from one of Pixar’s biggest competitors DreamWorks Animation. Their Madagascar and Kung Fu Panda trilogies – putting aside any spin-offs that may have come from those films – certainly started out fairly strong, continued being exceptional, and eventually ended with the best in their respective series, in the process winning over animation fans from just about every corner of the world; but it is DreamWorks’ How To Train Your Dragon series, based on author Cressida Cowell’s line of books, that is by far and away the strongest out of all their movies, as the first film was astonishing, the second even better, and the third a wondrous and beautiful conclusion that’s as fun as it is extremely emotional. Taking place around a year after the events of How To Train Your Dragon 2, the third film in the series sees young Viking Hiccup (Jay Baruchel) fulfilling his dream of creating a utopia where dragons and humans can live in peace, along with his trusted Night Fury dragon sidekick Toothless. However, Hiccup and his tribe face a dangerous threat from the evil dragon hunter Grimmel (F. Murray Abraham), which causes Hiccup to lead his people and all the dragons to a new location, where he, Toothless and company search for a fabled “hidden world” where dragons can inhabit with no human interference whatsoever. Meanwhile, Toothless is taken by a white-skinned female member of his species – dubbed a “Light Fury” by Hiccup’s lover Astrid (America Ferrera) – which causes Hiccup to finally realise that maybe it’s time to let his old friend go. What has amazed me most about all three films in this series is how they take stories that have been done to death in other films – the first one, for example, focused on the forbidden friendship between a boy and a dangerous beast, and the second one I remember taking an approach not unlike The Empire Strikes Back, while this one is definitely meant to be the emotional trilogy-closer that you see in many major film series – and tell them in ways that make you feel like this is the first time that they are being told. Writer-director Dean DeBlois – who flew solo in both fields on this movie as well as the previous one, after co-directing and co-writing the first film with Chris Sanders, his partner on Disney’s Lilo and Stitch – has a way of really telling this story in this world with these characters that makes you feel respected and not like you’re being talked down to; throughout, you’re stunned by how seriously the filmmakers are treating everything, and it’s very well-written and executed that you’re completely on board with these lovable characters at all times, laughing with them at all the right moments and feeling all sorts of other emotions when required. They are given satisfying enough conclusions that neatly wrap things up, but you’ve enjoyed spending so much time with these people, in this mythical world of Vikings and dragons, that you really don’t want to say goodbye. In terms of dramatic stakes, How To Train Your Dragon: The Hidden World manages to raise them to a far more personal level than the previous two movies, with F. Murray Abraham’s villain being the most effective in the series on the basis of his design and Abraham’s vocal performance alone (one of the weaker links in How To Train Your Dragon 2 was Djimon Hounsou’s villain, who in earlier versions of this movie was due to return for a redemption arc which was wisely nixed on the advice of DreamWorks head honcho Steven Spielberg). On the more heroic side, you are still very much enjoying the pairing of both Hiccup and Toothless, even though the introduction of a potential mate for the latter (whom the dragon tries courting in a very funny sequence that had the children at my screening laughing their little heads off) means that their friendship is being tested more than ever, and the resolution of their arc provides a very bittersweet moment that will leave most fans of this series on the cusp of tears. The animation in this series has been nothing short of phenomenal, and this film represents the very best that the series, and maybe even DreamWorks Animation as a whole, has provided. The detail that has gone into everything from the numerous dragon designs to the shades of grass that characters walk on, to even just shots of dragons flying in the background, is simply breathtaking; it all looks so real and gorgeously rendered that you actually want to walk or fly with these characters in this beautiful world, even though you know that’s not a possibility. This is probably the best animation I’ve seen since Spider-Man: Into the Spider-Verse, though of course it doesn’t come to anywhere near as stylish, and it hopefully sets up a bright year ahead for animated movies to make their cases heard before Toy Story 4 completely steals their thunder this summer. As this series draws to a close, it leaves me with hope that DreamWorks Animation still has it within them to produce quality animated movies to compete with Pixar. This is actually their first film to be distributed by Universal after being acquired by the studio back in 2016, after previous distribution deals with Paramount and 20th Century Fox during periods that saw them produce lesser material like Turbo and Home, and after seeing how they handled How To Train Your Dragon: The Hidden World, I certainly do hope that they can get back on second-to-top. 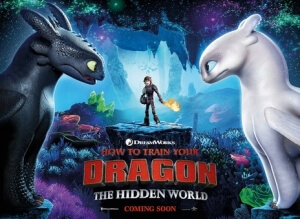 How To Train Your Dragon: The Hidden World marks the satisfying and thrilling conclusion to the hit DreamWorks Animation series, and it goes out with a strong blast of emotion and some of the studio’s very best animation.